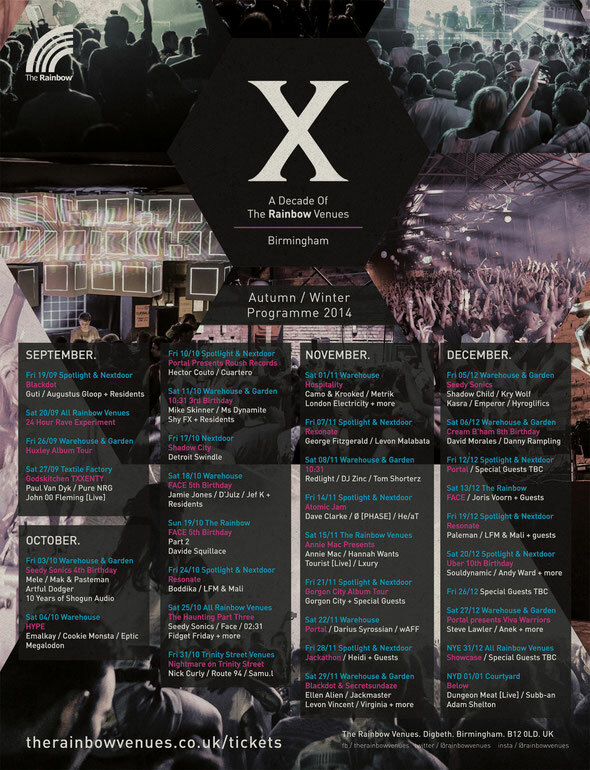 The Rainbow Venues get set for their A Decade of Music event, which kicks off this Friday; its biggest and best series of parties in the venue’s ten-year history. This run has been curated and programmed to showcase some top acts in electronic music across its selection of clubbing spaces. Nowadays, The Rainbow is spread over eight venues, ranging from cosy, intimate spaces, right through to vast, open plan industrial warehouses, including basements, gardens, factories and high tech venues with 3D mapping. Each boast their own individual character and personality, which means that whether you like it dark and dirty, ravey and outdoors or technologically advanced, The Rainbow and its various array of party spaces should have you covered. The ‘A Decade of Music' series brings together international headline talent from the worlds of house, techno, bass, dubstep and D&B, including; Annie Mac, Paul van Dyk, Gorgon City, Hannah Wants, Jamie Jones, Joris Voorn, Steve Lawler, Huxley, Shadow Child, Shy FX, Camo & Krooked and more. For those with a more refined palate, a selection of underground goodies are also on offer from artists Dave Clarke, Davide Squillace, Boddika, Levon Vincent, Virginia, D’julz and Jef K to name but a few. Supporting this entourage of DJs and live acts are the local residents, including the likes of One Records boss Adam Shelton, Subb-an, Tom Shorterz, Pete Graham, Samu.l, LFM & Mali Bunny and Lopaski. All the brands that have helped put Birmingham and The Rainbow on the map will be take stage in this 16 week long celebration, including Below, FACE, 02.31, Seedy Sonics, Blackdot and brands Annie Mac Presents, Godskitchen, Hospitality, Cream and Viva Warriors. There are more names to be added and parties to be confirmed in the coming weeks. Check the flyer.